Throughout parts of the Midwest, numerous people reported seeing the meteor that momentarily lit the night sky, rattled houses and caused the ground to shake. In at least one area, the meteor may have caused fires in some trees. The meteor was visible about 10:10 p.m. from southwestern Wisconsin and northern Iowa to central Missouri, according to the National Weather Service. Forecasters say the chunk of stony matter that fell out of orbit was part of a meteor shower called Gamma Virginids, which began April 4 and is expected to last through April 21, according reports in DesMoinesRegister.com. As large as the halo seems, history suggests the object might only be the size of a softball or basketball, said James Lattis, the director of the University of Wisconsin Space Place in Madison. "These things are surprisingly small," Lattis said. He noted meteor showers can produce streaks visible from miles away even though the objects that are burning up might be the size of a grain of sand. 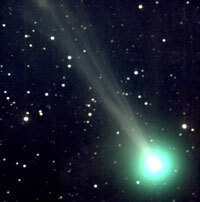 Meteors are caused by bits of space debris, such as that left by a comet. Dust and debris burn up in the atmosphere and create streaks of light. Unlike other celestial sightings that require a telescope or binoculars, the best way to watch a meteor shower is with the naked eye, The Associated Press reported.